Huge Inventory of Cleaning Supplies: Soaps, Mops, Brooms, Cleaners, Sponges, Towels, Gloves & More! At Cappello Janitorial Supplies, we offer Orange County residents great deals on household cleaning supplies and equipment. In business since 1964, we have earn 1,000s of loyal residential customers who rely on us for excellent pricing, quality products, honest recommendations and convenient delivery service. Our inventory includes a full selection of quality soap, cleaning solutions, mops, brooms, dusters, buckets, squeegees, garbage bags, all-purpose cleaners, toilet paper, paper towels, tissues, and more. We even offer expert repair service for vacuum cleaners of all makes and models, as well as affordable floor care machine rentals. Family owned and operated, Cappello Janitorial Supplies is fully dedicated to providing those in Orange County with above and beyond service. We always take the time to listen to our client's needs, ensuring we help them in selecting the most innovative and cost-effective cleaning products and solutions. We also offer invaluable advice, from safety tips to usage instructions for commercial-grade wet vacuums. We even help in determining whether one needs a regular household cleaner or a stronger cleaning chemical, such as a commercial-strength disinfectant, sanitizer, degreaser, deodorizer or mildew remover. With over 50 years of industry experience, Cappello Janitorial Supplies is Orange County's local cleaning expert. We're based in Santa Ana and available six days a week to help you improve the look and condition of your home, all while lowering costs, reducing physical strain and shortening the amount of time it takes to get the job done. So call today and let us help you achieve professional-grade results at your Orange County home. 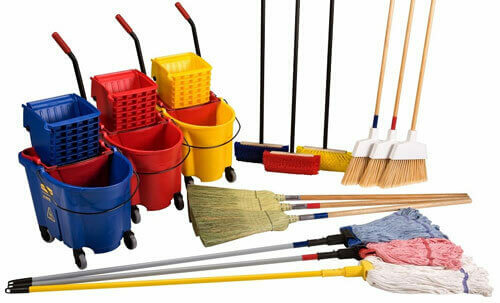 For more about the household cleaning products, supplies and equipment we sell, please click here. For more about our carpet and floor care rental and repair services for Orange County residents, click here.